Aristotle was the founder not only of logic but also of modal logic. In the Prior Analytics he developed a complex system of modal syllogistic which, while influential, has been disputed since antiquity--and is today widely regarded as incoherent. In this meticulously argued new study, Marko Malink presents a major reinterpretation of Aristotle's modal syllogistic. Combining analytic rigor with keen sensitivity to historical context, he makes clear that the modal syllogistic forms a consistent, integrated system of logic, one that is closely related to other areas of Aristotle's philosophy. Aristotle's modal syllogistic differs significantly from modern modal logic. Malink considers the key to understanding the Aristotelian version to be the notion of predication discussed in the Topics--specifically, its theory of predicables (definition, genus, differentia, proprium, and accident) and the ten categories (substance, quantity, quality, and so on). The predicables introduce a distinction between essential and nonessential predication. In contrast, the categories distinguish between substantial and nonsubstantial predication. Malink builds on these insights in developing a semantics for Aristotle's modal propositions, one that verifies the ancient philosopher's claims of the validity and invalidity of modal inferences. Malink recognizes some limitations of this reconstruction, acknowledging that his proof of syllogistic consistency depends on introducing certain complexities that Aristotle could not have predicted. 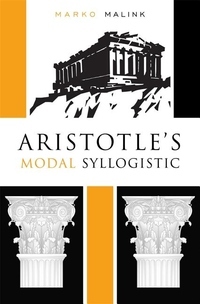 Nonetheless, Aristotle's Modal Syllogistic brims with bold ideas, richly supported by close readings of the Greek texts, and offers a fresh perspective on the origins of modal logic.